If you are thinking about amazing geometry and curves of this house so effortlessly mingling with each other then also note that this house accommodates a family swimming pool in just 450 sqm plot. And let me tell you everything has a functional aspect other than just design! 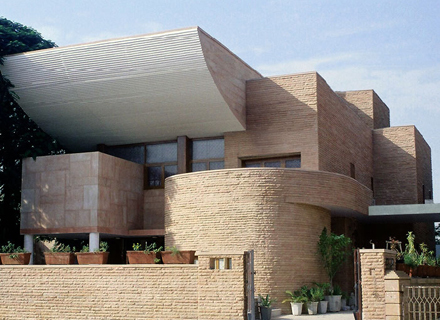 This stunning house is situated in Jodhpur city, in the middle of Thar Desert. All the creativity and talent @ architects Matharoo associates is at work here. Composite walls of dressed stone on the outside and brick on inside are used as construction methods. The brick stone composite wall insulates much more than ‘all stone’ traditional walls. Another great insulator is predominant focus of design – water – in the form of a swimming pool. To understand what kind of solace a swimming pool gives to people living without water for many generations, we need to actually live in a desert area! 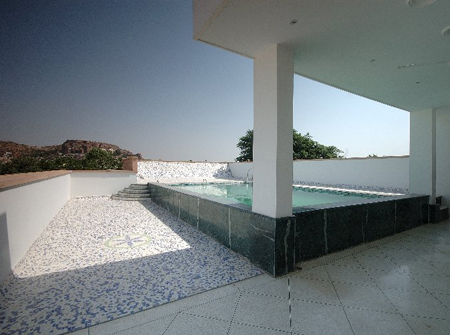 The swimming pool is made into a canopy, which shadows the stone boulders and makes the presence of water felt even if sometimes there is none. The living areas are shielded from sun with the pool above. 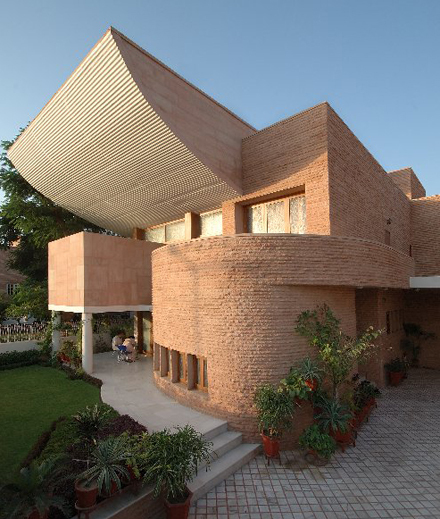 Simple corrugated GI sheet is used as formwork for the swimming pool soffit.